Corsair is of course no stranger to lapboards. The company has been offering a lapboard version of the gaming-focused K63 keyboard since last year. However whereas the K63 laptop setup ultimately used a standard wireless keyboard with an extra lapboard accessory – one whose lap-accommodations were focused on providing space for a wireless mouse – the K83 is an outright built from scratch lapboard, and one designed for broader uses as a general purpose HTPC keyboard. At its core, the Corsair K83 Wireless Entertainment is a 78-keys compact keyboard that uses Corsair’s ultra-low-profile scissor key switches, and a controller that supports a 20-key rollover as well as a 1000 Hz polling rate. So although it's not solely a gaming-focused keyboard, the K83 comes with gaming credentials, which is further underscored by its specially-painted WASD keys. The board can connect to host PCs using a 2.4 GHz dongle, Bluetooth 4.2, or a USB cable, and when working wirelessly, Corsair says that the battery should last for up to 40 hours. Meanwhile to build up its HTPC feature set, the Corsair K83 Wireless Entertainment is outfitted with a joystick to navigate through menus and play games, a multi-touch touchpad with discrete left and right click buttons, media playback buttons (that work when the Fn button is pressed), and even a dedicated volume control "scroller". This essentially makes the K83 a media keyboard on steroids, with further couch-friendly control options integrated directly into the board so that it can be used without requiring a discrete mouse. The joystick is an especially interesting design choice – Corsair is basically looking to emulate the right-half of a gamepad – and I'm not sure there's any other keyboard quite like this on the market. Of course, as this is a Corsair keyboard, the company's software stack is also a big part of their feature set. 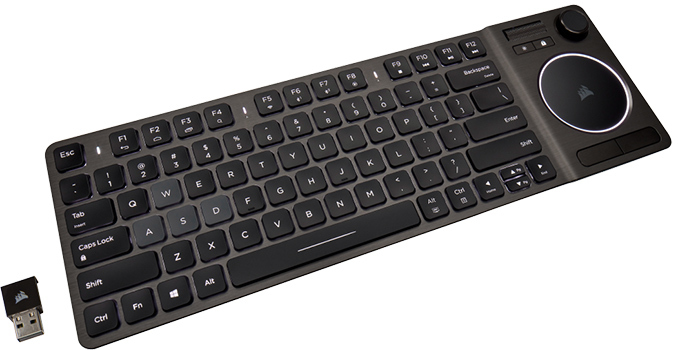 The K83 keyboard is compatible with the company's iCUE software, which can be used to recalibrate the joystick, configure Windows touchpad gestures, create macros, remap keys, adjust backlighting, and so on. 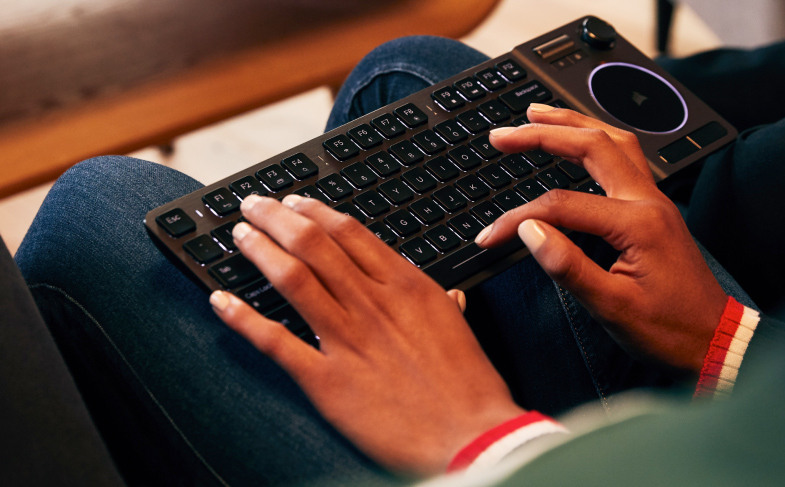 Finally, one of the particularly interesting HTPC-focused features of the Corsair K83 Wireless Entertainment is that Corsair is that Corsair is officially supporting the keyboard with more than just macOS and Windows, allowing it to be used with set-top boxes and TVs. 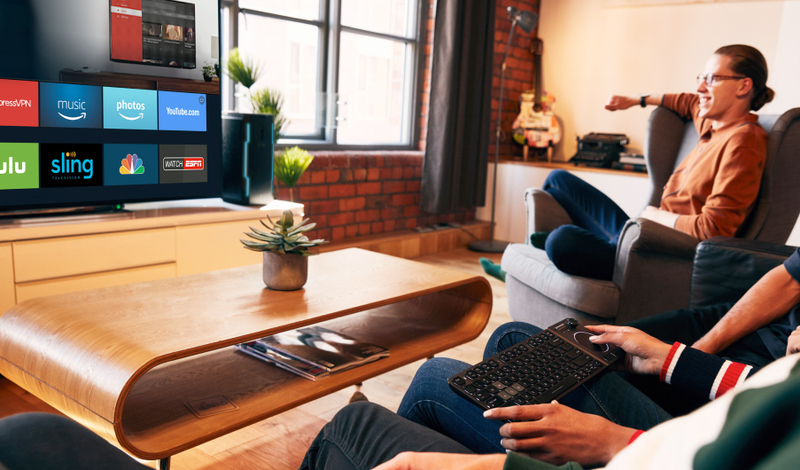 Other supported devices include NVIDIA's Shield TV, the Apple TV, Amazon's Fire TV, and Samsung's Tizen-powered TVs. Of course, not every feature works with every device – with Corsair taking care to document what works where – and generally speaking the more restricted an ecosystem, the fewer extra features like the touchpad work. But it's still an interesting take on compatibility, and making the keyboard more useful for more living rooms. The Corsair K83 Wireless Entertainment Keyboard is already available directly from the company as well as from its resellers. The board runs for $99.99 in the US.